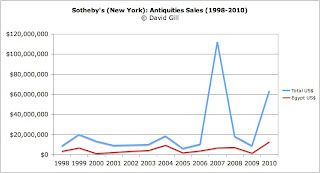 The results of today's sale of antiquities at Sotheby's have been released (see also Clarence Day collection results). Over $45 million worth of antiquities were sold over the last two days, of which $12 million were Egyptian antiquities. 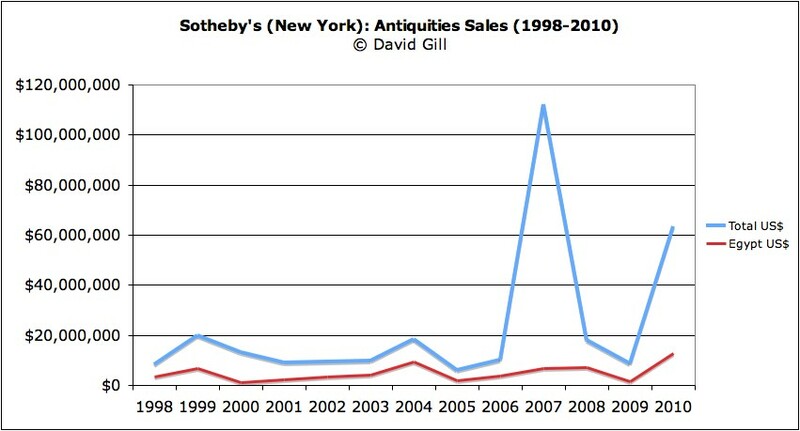 It looks as if the market is growing with over $63 million worth of antiquities sold at Sotheby's this year. Since 1998 some $64 million worth of Egyptian antiquities have been sold at Sotheby's, representing approximately one fifth of sales. Some 65% of Egyptian antiquities surfacing on the market through Sotheby's in the same period do not appear to have a documented collecting history pre-dating 1973 (the date of the AIA declaration). Approximately 95% of the Egyptian antiquities do not have a recorded find-spot. Staggering figures. I guess that's why they keep digging! This is of course the money made by foreign sellers, very little of this I assume will be going to Egypt, from where it was taken. I am curious, what kind(s) of material is responsible for the substantial peak in 2007?